TEAR can completely replace your sales force & deliver you qualified leads,ready to buy your product or service every day. TEAR is the #1 Mass Emailing Software that allows you to setup mutli-series autoresponders to replicate real conversations, increasing conversions exponentially! Anything you do online can be put under the scope & improved. Finish any other job that you might have done before, better. Email Autoresponder is an easy desktop email marketing software that delivers your auto responders ranging from the simplest "I'm out of office" to personalized HTML messages and newsletters. 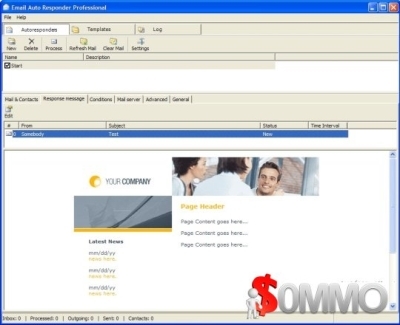 "Email Autoresponder is the most comprehensive and simple email marketing software. With excellent designs and powerful features you can get best results and beat your competitors." Mail using your Getresponse account very quickly. Use this utility.